Invincible Iron Man is still a little unfocused and quite pretentious. Surely, I’ve said that the Bendis books are treading water before, but it’s never felt as bad as it does now that his departure is just around the corner. I honestly believe that most pages of all the issues leading up to today’s #598 could have been omitted. I can tell you right now, the outcome is not going to be worth the wait. Does anybody actually care about that big #600? Does it actually mean anything to anyone if it ends with a whimper? Mild spoilers. 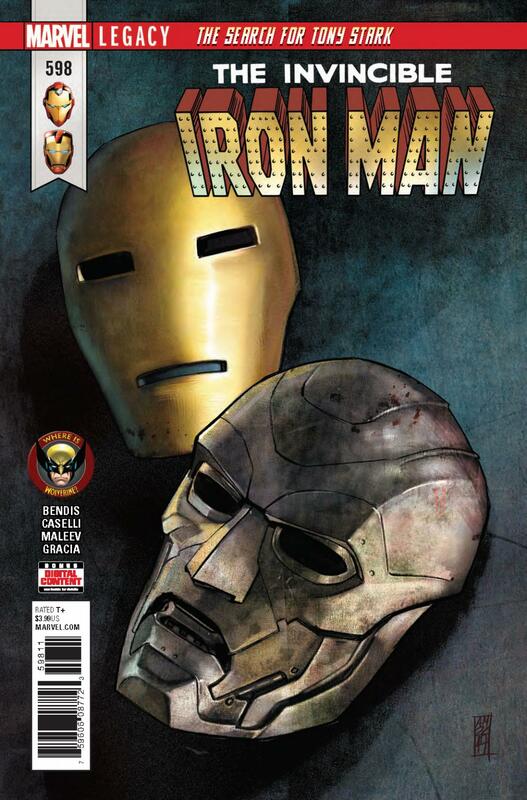 What I can say is that this issue is probably the most well put together of any thus far in the Search For Tony Stark. It’s just a shame that it’s part six. The kind of things happening here feel like they are meant to be part two or three at the latest of a mystery. I’m not sure what the numbers look like for this series at this point, but I guarantee that they would be better if the quality of the book hadn’t been put behind the numbering. The only reason I’m still reading is because I review for this website and I feel it’s my responsibility to finish what I’ve started. Otherwise, I’ve long ago lost interest in this. But Riri forming the “Armor Squad” and actually making some vague form of contact with Tony gives me the sense that there actually is something besides the obvious behind his absence. It’s the best, most tangible resemblance of progress that this arc has had so far. It’s brought down, though, by subpar dialogue. Doom’s is especially unenergetic. I mean, really, calling an opponent a thug? That’s it? Bendis has written him really well before, and recently, too, so I don’t know what gives here. Everyone’s else’s speech is as usual trying too hard to mimic real life conversation and failing. I can’t not roll my eyes at it. Stefano Caselli holds up his end of the deal well by keeping this book as clean as ever. His is a style that welcomes casual audiences with “safe” presentation, while Marte Gracia’s shading is always adding the next layer that brings it to a new level in showing emotion and providing tension to the more dramatic parts. Giving Friday a pixelated look when she’s being hacked is the kind of detail that goes a long way in making art feel fully realized. Alex Maleev’s pencil work is always enjoyable and a good fit for Victor’s story. I’m glad that he was kept on board rather than Victor’s story being absorbed by Caselli. His color work, though, does feel like it’s too reliant on gray areas, which can make it feel a little bland. So much of the color could be a better fit for a specific environment, but the backgrounds are left mostly blank, leaving the other end unfulfilled.